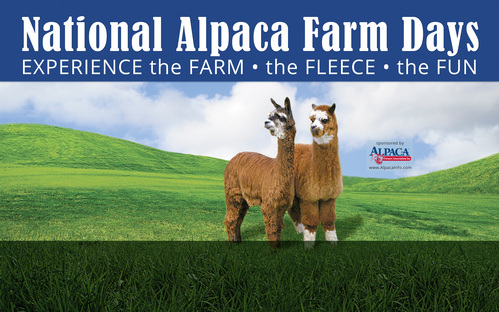 We are part of "National Alpaca Farm Days", an event taking place all across the country which encourages people to visit a farm and explore the wonderful world of alpacas. Our 10th Annual Fall Festival is the same weekend of Saturday, September 29th and Sunday, September 30th so make your plans to join us for a great time! 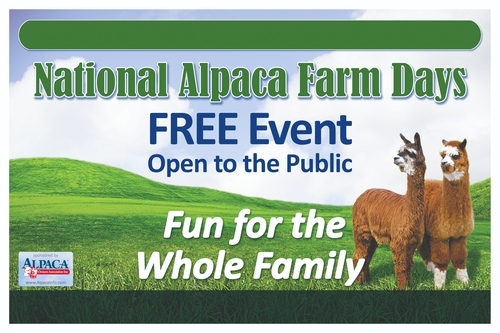 Come out and be a part of National Alpaca Farm Days while enjoying a beautiful afternoon in the country. We look forward to seeing you! 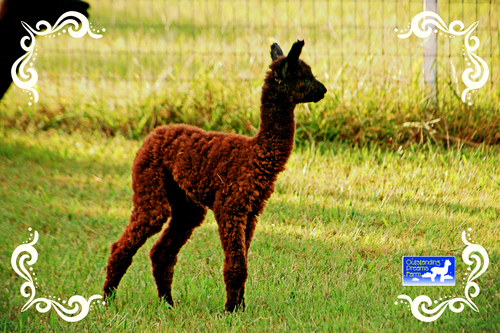 New baby alpaca "Go With The Flo"
We are pleased to introduce the newest member of our herd, Outstanding Dreams Go With The Flo! 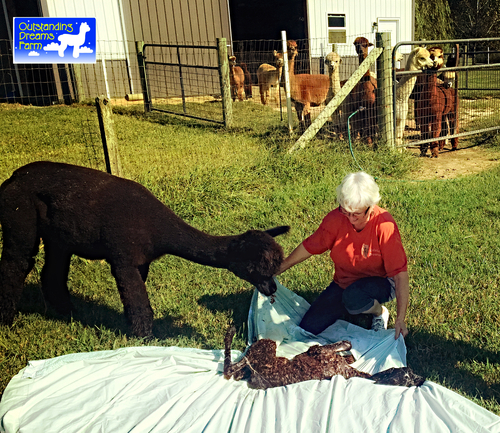 Named after Hurricane Florence, Flo was born early Thursday morning just as the storm was preparing to make landfall. Flo is the kind of cria we all hope for as she was already up walking around and trying to nurse when I came out to the barn. Big, strong, healthy, and stunning she's sure to take the world by storm! 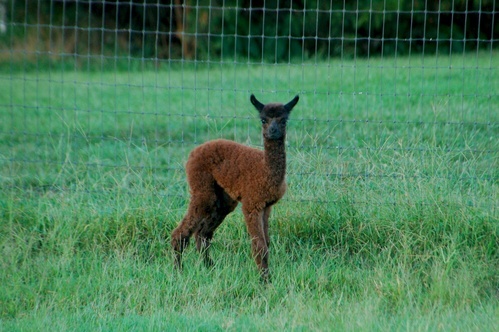 She is the second of our McCoy's crias to be born, and the sixth of his offspring to hit the ground. We're ecstatic with what he's producing so far as his first six offspring have all been female, and quite nice ones at that! 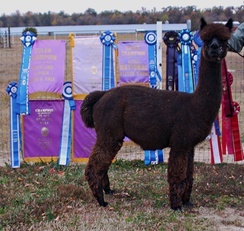 We're especially pleased that he's throwing dark colored offspring as this is the mainstay of our breeding program. 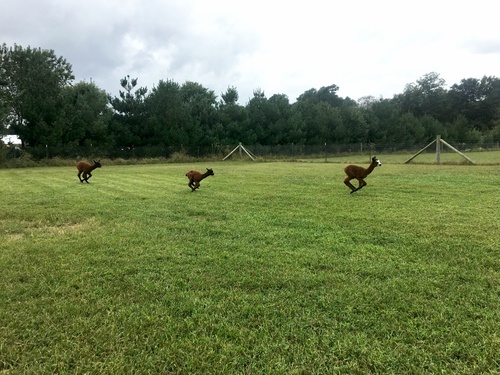 Cria season is in full swing here with three on the ground and four more expected. Be sure to keep an eye out for our next birth announcement! As you all know, we have been looking forward to celebrating our Fall Festival with you this month. Due to the potential for poor weather across the Delmarva Peninsula which was predicted earlier this week, we felt it was best to reschedule our event. 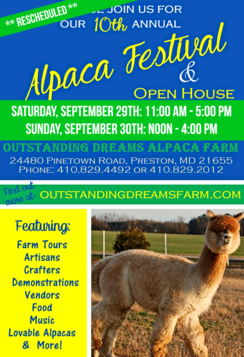 Please, come and join us as we celebrate ten years of hosting this free, family-friendly event in Caroline County, Maryland during the last weekend of September! We look forward to seeing you here at the farm! As I came out to the barn early on Tuesday morning, I spotted something small laying on the ground just outside the barn door. 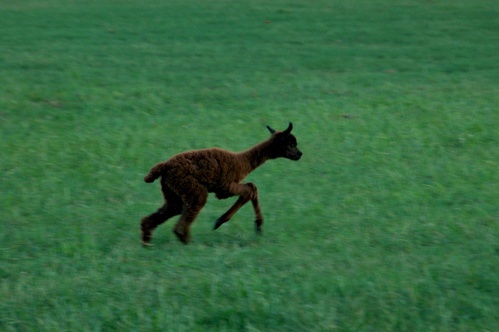 We had a cria born the previous morning and at first glance I thought this was her. 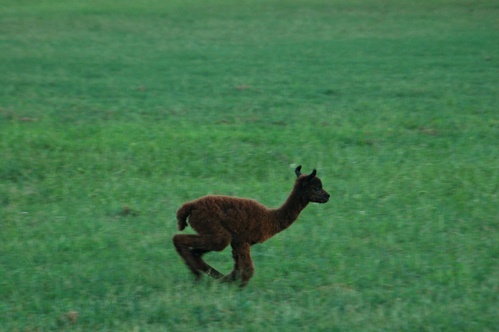 As my eyes focused, I saw the other cria walking around the pasture. It then dawned on me that we had a new arrival! We got the hairdryer out trying to warm him, covered with towels and continued trying to stimulate him. Luckily our vet was already scheduled to come out that morning to check on the cria born the previous day. I sent her a text letting her know that we had a problem and she recommended that we prepare plasma so that she could give a transfusion as soon as she arrived. She also suggested giving him a little colostrum and some Karo syrup while we awaited her arrival. A couple of hours passed before she arrived and he was going downhill. He was basically a wet noodle. The plasma was administered and still he did not respond. We all knew his chances were not good, but we didn't give up and neither did he. I kept going out and giving him colostrum and Karo syrup a little at a time and very gradually he gained strength. Late in the afternoon, he was finally strong enough to take a few ounces of colostrum by bottle and actually stood up and walked a little on his own. 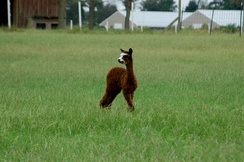 A couple hours later, he walked around the pasture a little further. 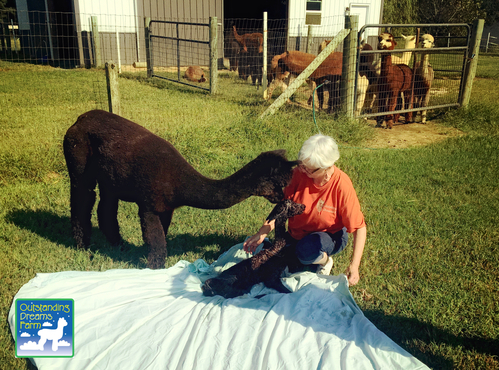 I went out to the barn early the next morning and the little guy got up walked over to Mom and started nursing! Unbelievable! 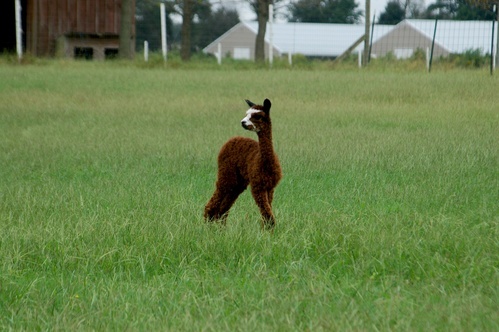 He has continued getting stronger and on day two is actually up and running with the other cria! I strongly believe in the power of prayer....plasma....and preparedness - and never giving up as long as there is a glimmer of hope! We've decided to name this boy "Outstanding Dreams Comeback Kid" - he's little, but mighty! 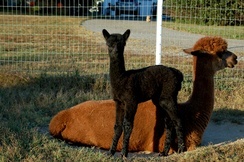 On Monday, September 3rd, our girl Mercy finally had her cria. All is well with our new big, strong and healthy female. 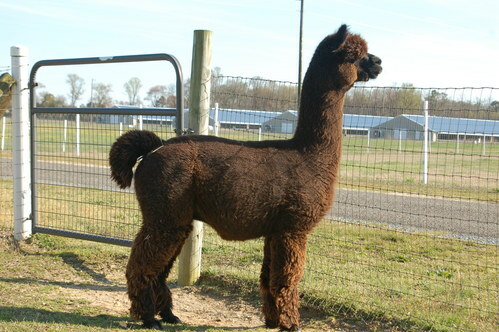 Her father was Snowmass XXXtreme, one of the most well known herdsires in the country. 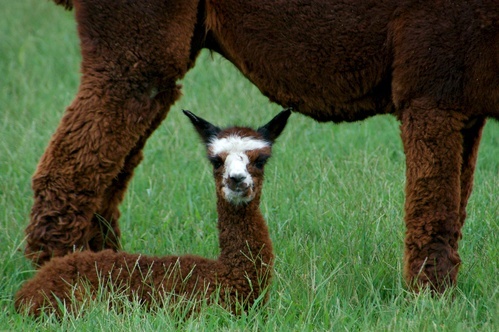 He passed away at the age of seventeen shortly after this breeding and this will be the last of his cria. Here are some photos of her first day here on the farm! We have some amazing new merchandise in our retail shop that just arrived this week and we are so excited to tell you about it. 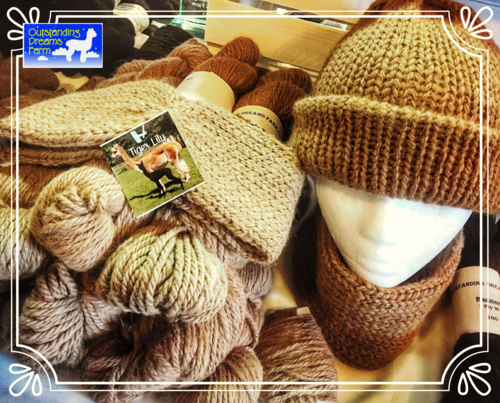 Partnering recently with a manufacturer who has the ability to create beautiful fiber items from the fleece of our own animals is opening up new possibilities for "products from Preston"! 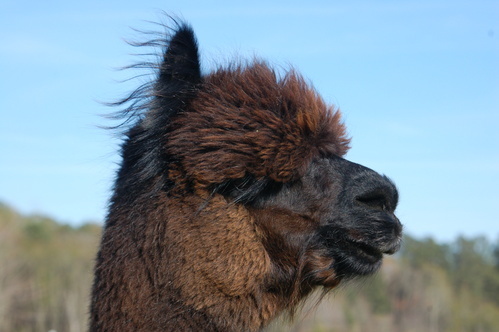 We are so pleased to now offer scarves, hats and premium yarns created from the luxurious coats of the alpacas and provide a truly special connection to our farm. Shown here is a variety of items from "Tiger Lily". We can't wait for our customers to come in and enjoy purchasing and wearing these distinctive accessories. 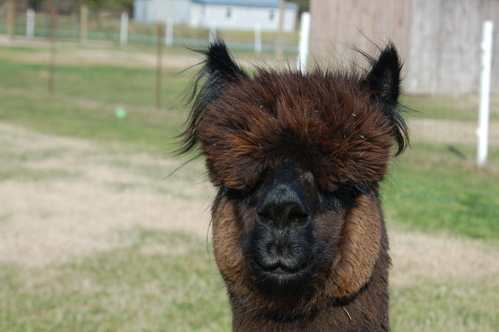 Plan a visit to our farm to see for yourself what happens when the beauty of alpacas meets quality fashion! 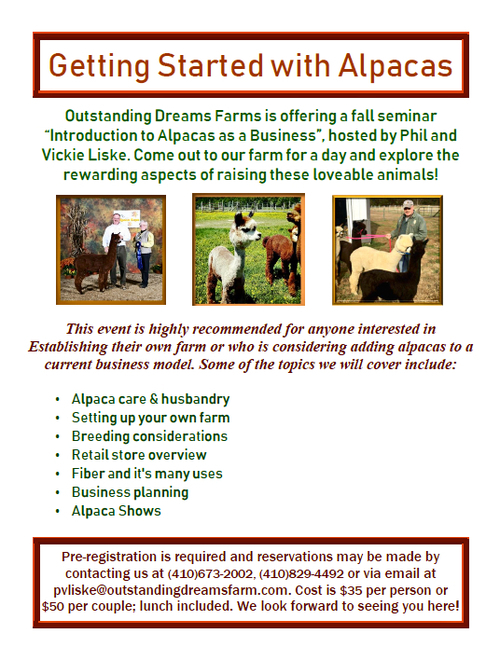 Fall Seminar: "Alpacas as a Business"
Fall Alpaca Business seminar takes place Saturday, October 6th at Outstanding Dreams Farm. 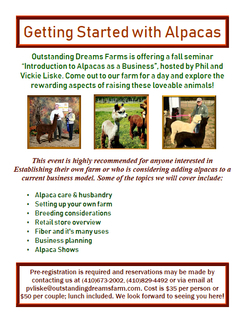 We are excited to be offering another seminar here at Outstanding Dreams Farm. 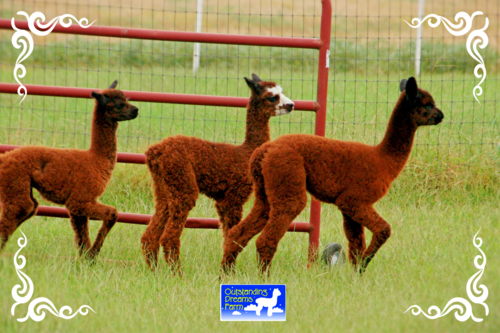 Various aspects of starting your own herd, care and raising alpacas, and breeding and showing considerations will be discussed. 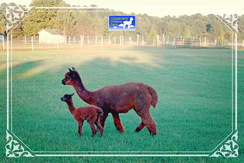 We will have a meet and greet with our own animals so that you can ask any questions you may have, along with providing a wealth of informational material. Pre-registration is required and the seminar runs from 9:00AM until 2:00PM. Reservations for Saturday, October 6th may be made by calling (410)673-2002 or emailing us at pvliske@outstandingdreamsfarm.com. Cost is $35 per person or $50 per couple which includes lunch. We look forward to seeing you here! 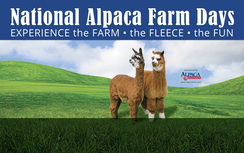 Today was a rewarding and exciting day as I was asked to visit a new client's farm and advise on pasture and barn set up for their new herd of alpacas. I've done this often and find it to be one of the most rewarding aspects of the business! 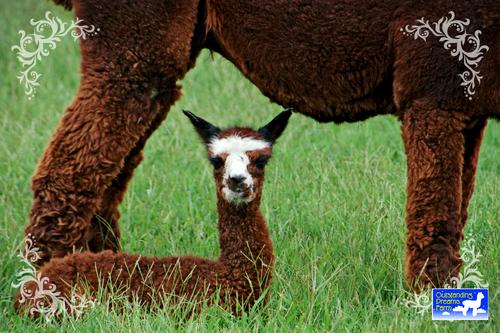 To be a part of the new breeder's planning and especially to share in their excitement is an incredibly wonderful experience for me and I consider it an honor to first, be selected as the alpaca breeder that they chose to purchase from, and secondly, to be asked for my advice on setting up their farm. 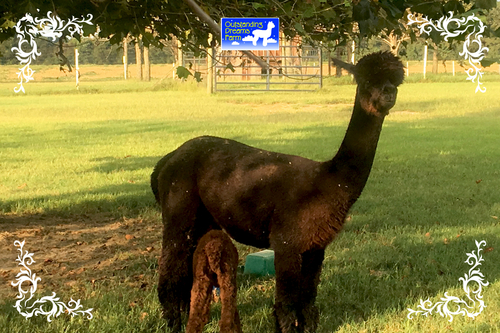 Thank you and congratulations to Scott and Bonnie Bieber of New Groove Alpacas in Middletown, Delaware on their purchase of four of our females! 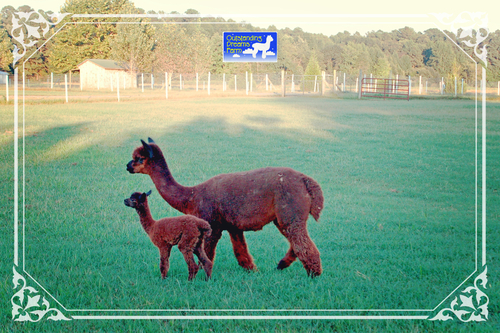 We know they are in good hands and we look forward to working with you as you enter your alpaca venture. Okay, Maybe Magic is not a young man, but he is going West! We are excited to announce that AW Magic will be heading to his new home at Wild Hair Alpacas in Colorado Springs, Colorado. There, he can continue his breeding career with a herd of unrelated females. 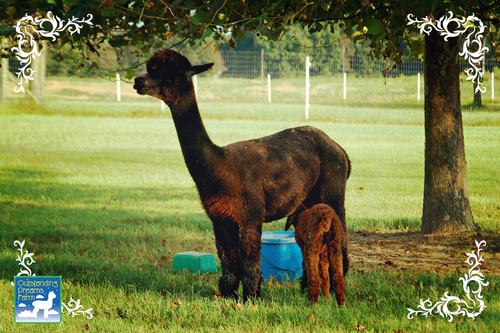 Magic joined our herd in 2012 and has been a cornerstone of our breeding program. 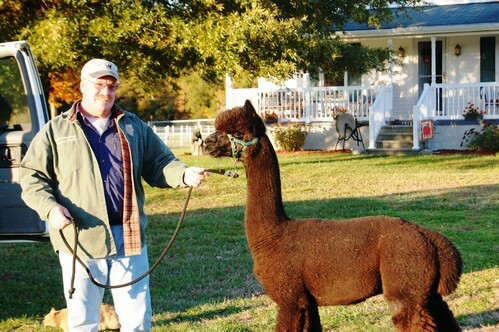 He has given us and our clients many award winning offspring, being a consistent producer of dark, show quality crias. He's also been a pleasure to have here on our farm , being a real gentleman and passing along his calm disposition to his offspring. We will miss him dearly and parting with him is a difficult decision. 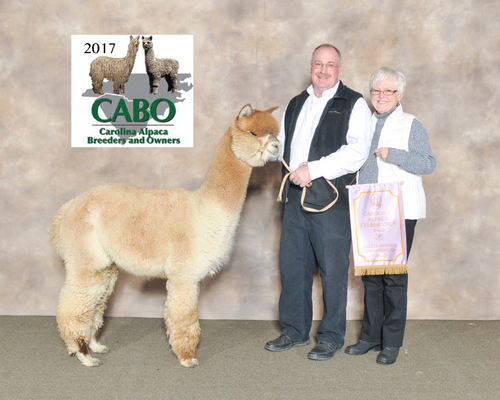 However, he is related to many of our females and it is time to put him in a position where he continue passing on his outstanding genetics at another farm.